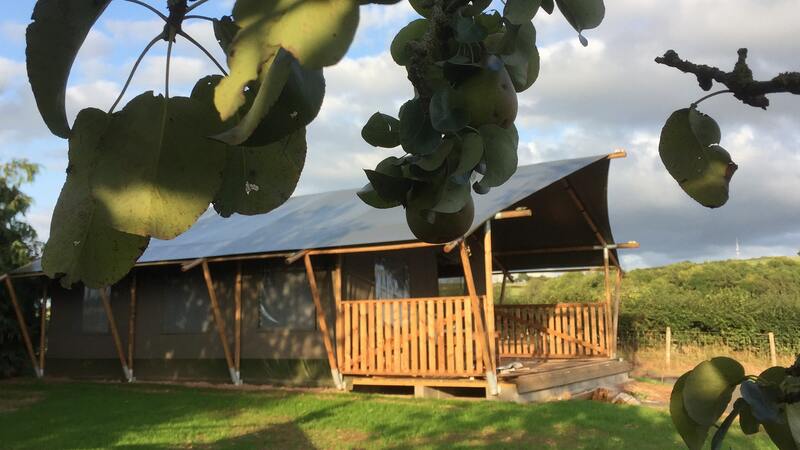 Our grand wooden framed safari tent is a great glamping option, with a spacious living area, which comfortably sleeps four adults and two children. Majestically African in Looks but purely Welsh in spirit! This stunning safari tent is perfect for a romantic getaway for two or a fun family adventure. Whatever your looking for, this amazing tent can top your expectations. Whilst sat on the comfortable balcony seating of the tent, breathe in the fresh country air and admire the scenes of farm life all around you, with the Brecon Beacons and Black Mountains in the distance. There is also a picnic table on the surrounding grass for alfresco dining. Mid Wales is one of the most popular hiking destinations in Europe, also close by is the World Book Town of Hay-on-Wye, as well as the Agricultural town of Builth Wells and the picturesque town of Brecon. An ideal base for touring Mid Wales; Walking, cycling, pony trekking, fishing, canoeing, golfing, or just simply relaxing. Closely located to The Royal Welsh Show, Brecon Jazz and Hay-on-Wye Book Festival. Bryndu is a place to relax and be in the moment, whilst being at one with nature. We believe that once you’ve experienced the fresh air, the evenings sat on the deck watching the red kites swooping overhead, the dark night skies and restful night’s sleep, you won’t want to leave.